I knew from a young age I was going to play the clarinet. That was my mom’s instrument, and I thought following in her footsteps would win me a ticket to joining Band with my friends in fifth grade. I had to wait three whole years — a lifetime, to a kid — before being permitted to sign up for Band. Because I was already so far behind, I brought my “licorice stick” home to practice every night that first year. It worked, eventually earning me a scholarship to college. My college Band was planning a reunion. We wouldn’t actually take to the field at halftime (some folks were too old! ), but we’d sit in the stands and play familiar songs. Circumstances intervened, and I couldn’t attend. No matter. They assured me they’d have another in a few years. That got me thinking. What a great “excuse” to learn a new instrument, something I’ve wanted to try for a long time. It’s well documented how beneficial playing music is (see here or here) and my decades of training put me ahead of the game. When it arrived in April 2016, I removed the head joint and blew into it the way I’d learned online. A note came out! I figured I was on the right track. So I contacted the music department at a nearby college and found a flute student willing to give a few lessons to an adult beginner. When she graduated, I inherited a second student instructor, who assures me I’m progressing nicely. Probably because I chose the instrument, paid for it, am interested in mastering it, and make practice a priority. Here we are a year and some months later. 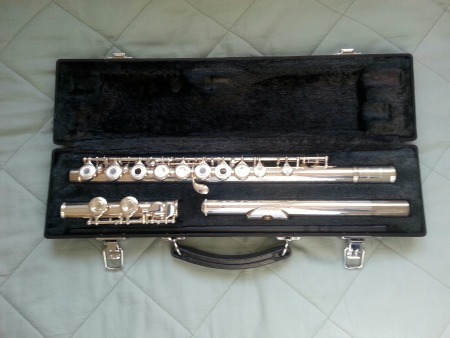 I’ve upgraded to a new flute and am loving the experience even more! Now I firmly believe in Lifelong Learning, and I’m aware that taking music lessons as an adult is as beneficial as taking lessons as a kid. Maybe I’ll never play professionally, but nobody can squash the feeling of satisfaction that comes from learning something new. And won’t my colleagues be surprised when we do get together and I whip out a flute, not a clarinet?!! This entry was posted in Uncategorized and tagged adult music lessons, band, beginning as an adult, lifelong learning, music. Bookmark the permalink. Wow! I am so impressed! Good for you and I bet your fellow band members will be wowed too! I love how poetic and airy the flute sounds. It’s not easy for adults to put themselves on the line and learn something new! I am sure you know (Dawn, fellow sheltie Mom) also plays in a band! I would love to hear you play…and uhm, with new-fangled technology that is completely possible. Vimeo or YouTube! Thanks for your encouragement, my friend! You’re right — it’s NOT easy, but we all know that nothing worthwhile ever is. Dawn actually inspired me, with all her posts about playing in a band, and I hope by next summer I’ll be “good enough” to join our community band. Fingers crossed! As for putting a selfie-video online, well, maybe … someday! I started clarinet in 3rd grade, and continued on through my freshman year in college. At that point, I realized that I wasn’t willing to put forth the effort to become a concert-level musician, and I didn’t want to teach junior high band, so I went in other directions. It’s wonderful that you’ve begun with the flute, and are putting in the effort to really learn it. At first I thought, “How does she find time to do that?” Then, I realized that your flute is my photography. We’re both putting in time, learning a new skill. And it’s obviously of great benefit to us both! Ah, a fellow band member! It never ceases to amaze me what valuable lessons music imparts. For years I’d missed being a part of all that and while I know we can’t go back to our youth, we can pick up where we left off and make new memories. Great analogy, Linda — my flute is your camera. We know an avocation requires some time and effort, but what a payoff!! I think the happiest adults are those who find themselves “consumed” by something bigger than they are. Something that lets them stretch their knowledge and abilities, something that brings enthusiasm back into their lives. Sad to think how many folks just sit and stare at the TV all day. I’ll never sit and stare at the tv. I threw them all out in 2011. So far, I haven’t missed them. I’m right there with you. If not for my mom, I’d have tossed them all out, too. They’re merely aggravating noise-makers, and hearing the talking heads holler at each other gets on my last nerve! Yep. I got rid of mine the month after my mom died. After I disposed of hers, I thought, “Why am I keeping mine? She won’t be down here to watch mine, either.” Gonzo! I didn’t realize she’d been gone that long. I know you miss her — but not the TV, hee hee! Isn’t it amazing how quickly time passes? I finally got out Dixie Rose’s papers and discovered that she’s seventeen years old. Goodness me — an old lady! You know, FF, I think everybody can benefit from music, even if it’s just listening to it. That said, I’m glad you’re getting into guitar — was a certain Professor who’s been AWOL around here for months the catalyst for that?!? Even if we never play professionally, there’s still so much to enjoy — the learning process, the baby steps, and eventually the realization that we’re actually making music. Hang in there … maybe one day I’ll get to hear you on YouTube!! I tried guitar years ago and was doing okay until my house was burglarized and the thieves snatched it. I just didn’t feel like replacing it. Gee, if they’d only waited a few years, they might have scored one like you did!! Oh, what a WONDERFUL story, Debbie! And I so admire and applaud you for your accomplishment. You GO, girl!!! A-men! I think it’s so important as we getting older to keep on moving forward, take chanced, learn new things, and keep growing. It’s so important to stay involved. And it’s funny you mentioned the clarinet because I took lessons when I was a kid, but didn’t stick with it long enough to see if I was any good because I was more interested in the piano. But I remember listening to Pete Fountain (a clarinet player) records that my father owned, and trying to imitate him by pretending to “clarinet-sync” to his records. HA! Ron, you make me blush! I felt a bit awkward at posting this one. I was afraid people would think it a silly waste of time. How wrong I was, thankfully! Everybody has been so supportive, and I’m awfully grateful. I didn’t realize you were a flute player, Virginia — now I know who to bother if I can’t reach my teacher, ha! No, seriously, you know how hard it is. But how much easier to pack a flute for a long-distance trip rather than, say, a piano or set of drums!! Yes, dust that baby off — you’ll probably be surprised by how much comes back to you. Thanks, Lana. I’m sure a LOT of folks would consider it a waste of time. After all, there are only 24 hours in a day and for most of us, our schedules are already full without adding anything. However, the literature shows such amazing good things from the study of music (or a foreign language or puzzles etc.) that how can we not make room? And besides, squeezing out an hour a day for something I love makes me more creative with the time I do have left!! Wow Debbie you earned a scholarship for your musical talent, I knew you were gifted writer, but had no idea you also have this hidden skill. I also love the idea that you took up a second instrument later in life. You have inspired me to go back and try to tune up my rusty old guitar. That’s wonderful, Pat! Yes, definitely try that guitar again — you might be surprised how much comfort it gives you … and how enjoyable it is now that you have time to spend with it. I know I’m a better musician now that I practice because I want to, rather than because my mom is forcing me to, ha!